The quality of a customer care strategy can make or break a company. Simply resolving a customer service issue or complaint is no longer enough— in a competitive, customer-obsessed environment, there is always room for improvement. In a recent research report on Customer Effort, Interactions found that customers simply aren’t willing to spend a lot of time getting their issues resolved. That’s why brands today need to design a modern customer care strategy that not only addresses their customer’s needs, but also removes effort and frustration. And do all of this while reducing the ever increasing cost and complexity of customer care. 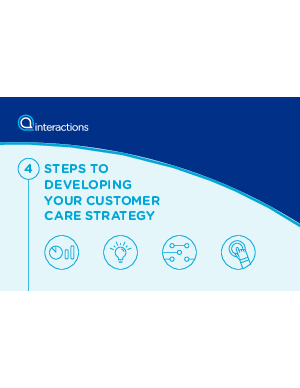 So how do you get started with developing a successful customer care strategy? We’ve outlined 4 steps that address the major points you need to consider when building a customer care roadmap.